Well the inner workings of hot water systems are made to heat up the water- right? Yes, but there is point where it can be too much and actually damage your heater. Why is it bad for your hot water heater to overheat? Waters at high temperatures are potentially dangerous as hot water obviously burns, but can also be dangerous to your hot water heater. If the hot water boils over or even over heats more than what is recommended in your cylinder it can dramatically reduce the life expectancy of your hot water heater. It reduces the life span by creating tiny cracks in the vitreous enamel lining on the inside of the tank, with prolonged over heating these cracks will become worse and worse. Once the vitreous enamel has been eaten away over time the water will then start to eat at the steel tank cylinder. For electric hot water heaters the primary form of protection is an ECO or energy cut out. Inbuilt into the thermostat of the hot water heater is a temperature disc. This temperature disc discharges at setting of around 85 degrees depending on the type and brand of thermostat. (The most common brands of thermostat in the market place are the Klixon and Robertshaw) When this energy cut out activates it de-energises the element to stop the water heater from heating any more. At this stage you would soon have no hot water and need to phone a technician at Same Day Hot Water. For gas hot water heaters, the unitrol works as their primary form of over temperature protection. At temperatures ranging between 70 and 85 degrees (depending on the brand and type of controller the most common in the market place being Robertshaw and Eurosit) the ECO will activate cutting the gas off. At this stage you can make a phone call to us here at Same Day Hot Water for us to get you back in hot water! The secondary for of over temperature protection is done through the pressure temperature relief valve. The relief valve usually has a setting between 95 and 99 degrees before it fail safes and dumps water to cool down the tank. It does this through a wax element inside the valve detecting temperature high temperature and opening up. What is an anode? How does it work? What is an anode and why is it so important? Water heaters have anodes in them to protect them against rust. This enamel coating is subject to extremes of temperature and pressure which causes it to deteriorate over time. Therefore, all glass-lined tanks are also fitted with one or more sacrificial anodes to protect the steel tank against corrosion as the glass lining loses its effectiveness. Even in places like Sydney and Melbourne, where the water quality is quite good, (TDS*) readings of less than 100 parts per million) anodes in small water heaters can last for as little as 4 or 5 years before being expended and thus allowing corrosion to commence. NB: Refer to the section – “How long should an anode last before it needs replacement” to see how long an anode should last for each size of heater. By simply replacing a heater’s anode when required, (the period varies depending on the size and model of the heater) the same protection is provided that keeps ships afloat, underground steel pipelines and tanks corrosion free and even Australia’s and the World’s sea-based oil drilling platforms intact. – That’s why the heater manufacturer put the anode there in the first place. How can corrosion take place in an enclosed tank full of water? Corrosion in water heaters is associated with the passage of minute electrical currents which travel through the metal and the water. Corrosion takes place at the anodic areas (the anode) which are the places where the current releases ions to dissolve in the water. Cathodic areas develop at other sites (the tank walls) where the circuit is completed and at these places, provided there is an effective anode working inside the tank, no corrosion can, or will, take place. Anodes corrode – cathodes do not. Once the original anode stops working, the steel tank will react with other incompatible metals such as the copper pipes, brass fittings and the element/s. Once this occurs, the tank wall becomes anodic and corrosion (rust) commences and the tank will very quickly rust through. Anodes are manufactured from a special grade of magnesium and they protect steel by a sacrificial electrochemical action. Magnesium is electro-negative relative to steel. When a magnesium rod is fitted to a steel tank filled with fresh water, a current will constantly flow through the water between the rod and any exposed steel area on the tank wall. The circuit is completed through the tank back to the magnesium rod. This protective current is produced by the magnesium releasing ions, and this results in corrosion in the anodic area. The magnesium (the anode) corrodes instead of the steel tank (the cathode). This principle of electrolytic corrosion control is called cathodic protection. Because cathodic surfaces cannot rust, the steel tank is protected. This principle is nothing new. No experienced boat owner would risk the propeller, rudder, shafts or other exposed metal equipment on his boat, when all it requires to ensure that they do not corrode, is to keep an effective sacrificial anode in place on the hull of the craft or on the motor itself in the case of outboards. The same system is used on all commercial shipping, oil drilling platforms as well as underground pipelines and storage tanks. It’s far more economical to replace the anode than to allow the vessel itself to corrode. This logic also applies to domestic and commercial water heaters. All gas, electric and solar mains-pressure water heaters with a vitreous enamel or bonded ceramic coating utilize a sacrificial anode to provide additional corrosion protection. The common brands are Rheem, Vulcan and Dux as well as Solahart solar heaters. Which heaters do NOT have an anode? Gravity Fed Tanks located in the ceiling. 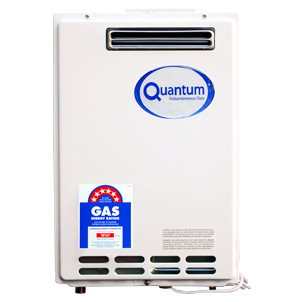 All types of Continuous (Tankless) Gas Heaters. These are small, wall-mounted heaters which heat the water as it passes through them. Common brands are RINNAI Infinity, Rheem Integrity, Dux Endurance as well as Bosch, Pyrox, Zip, etc. Stainless Steel and Copper Storage Type Heaters. These heaters look similar to the ones that do require an anode. They are generally the same size and shape but the tank is either stainless steel or copper and does not require an anode. Brand names with a stainless steel tank are Aquamax gas heaters and Edwards, as well as some models of Beasley, in both electric and solar types. Copper tanks haven’t been produced for many years, but there are no doubt some still surviving because they have been known to last for 40 years or more. They don’t ever have anodes in them. The older a heater is, the greater the likelihood of it having little or no remaining active anode and at the same time, having experienced an appreciable deterioration of the “glass” lining, thus leaving areas of exposed steel wall where corrosion may have already started. While that corrosion cannot be reversed, it can certainly be arrested by the introduction of a new anode, which can get to work by reversing the electrical flow and converting the tank wall back to a cathode (parts of it will have become anodic after the original anode ceased operating). Anodes are manufactured by extruding the magnesium alloy onto a central core of 3mm diameter mild steel. Where an anode is active and working effectively, it will appear sharply pitted and the “valleys” of this pitting will be grey in colour the same as the original magnesium. As the anode corrodes, it will wear down to the core and then progressively expose the core, usually from the top down. Ideally, the anode should be replaced before it has worn down to the core in order that there is sufficient surface area of magnesium to provide adequate corrosion protection. As many as 50% of anodes become inactive, or passivated, and in these cases, the anode is not sharply pitted as above, but appears smoother and will be partially or fully coated with calcium carbonate, usually brown in colour or sometimes white. These anodes can be quite thick and appear to have sufficient magnesium left, but because it is heavily coated it is providing little or no effective protection to the tank and such anodes should be replaced. Our experience tells us that, the longer and/or the thicker the anode, the longer its life. Nevertheless, all heater manufacturers are very definite in recommending that anodes should be replaced in order to ensure maximum effective life of their heaters. *These suggested replacement times of the original anode must be used only as a guide. Natural waters contain a wide variety of dissolved salts, all of which act as carriers of electric current. The higher the salt content of the water, the lower its electrical resistance and the greater the corrosion potential. Artificially softened waters are exceedingly corrosive, because the process merely substitutes a sodium ion for the magnesium and calcium ions and this takes away all of the scale forming ability, but does nothing to reduce electrical conductivity. Hot water storage tanks are under constant pressure, so each time a hot water tap is turned on or off, the tank expands and contracts. Washing machine solenoid valves and ceramic mixer taps turn on and off more sharply than screw-type tap mechanisms which results in fast pressure changes inside the tank. These changes in pressure cause the glass lining of the tank to crack thereby exposing the steel of the tank to the effects of corrosion. Anodes in gas storage heaters usually last longer than those in electric tanks because gas heaters are typically operated at a lower temperature than electric heaters and having no copper element in the water means that there is less corrosion of the anode resulting from electrolysis. Hot water is more corrosive than cold water, so the anode is consumed more quickly when the thermostat is set higher than necessary. It obviously consumes more heating energy as well. This point partially explains why anodes tend to wear more quickly at the top than elsewhere. Most heaters should last around 12 to 15 years. There are always exceptions and we have seen heaters 20 or more years of age which are still providing good, clean hot water. On the other hand, we have also seen a few heaters which have rusted through as early as five years of age. Obviously both are extreme examples. Experience has shown us that, once rust gets started, it takes about three years for it to eat right through the tank wall. Therefore, the average heater only starts to rust at the 10 to 12 year mark. For this reason, we believe 12 years should be the limit for replacing anodes in standard model heaters. Again, exceptions can be made when the heater looks in good condition and where the anode is still working. (That is when grey metal is clearly visible, indicating that anodic reaction is still taking place.) If water quality is tested and there is no discolouration, we see no reason why the anode should not be replaced. This is particularly applicable to Rheem Optima® models which have a heavy duty anode in electric heaters and twin anodes in gas models as well as having a heavier coating of vitreous enamel. However, take special care with the twin element electric tanks as we have seen some of these models fail within the ten year guarantee period. There are a number of factors that will affect the length of service the water heater will provide. These include the water quality, the water pressure and temperature (inlet and outlet) and the water usage pattern. However, your Rheem water heater is supported by a comprehensive warranty. An anode is installed in your water heater and will slowly dissipate whilst protecting the cylinder. The life of the water heater cylinder will be extended by arranging for an authorised person to inspect the anode and replace it if required. For softened water supplies or in areas of bad water quality, it is recommended the anode be inspected 3 years earlier than shown. Replace the pressure & temperature relief valve. Clean and service the gas burner and pilot on gas models. In the market for a new hot water system? Looking to replace your existing hot water system? Hot water systems are available in many different capacities. Some criteria may be obvious, but here is a helpful list of factors to consider when choosing the right hot water system for you. How many bathroom or people will be using the hot water at once? How many adults, how many children? Keep in mind teenagers have high hot water usage. Young children have low hot water usage. What type of fuel do you have at your house? Natural gas, liquefied petroleum gas, or both? Looking at environmentally friendly options?